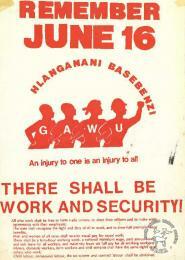 SAHA - South African History Archive - REMEMBER JUNE 16 : HLANGANANI BASEBENZI : THERE SHALL BE WORK AND SECURITY! 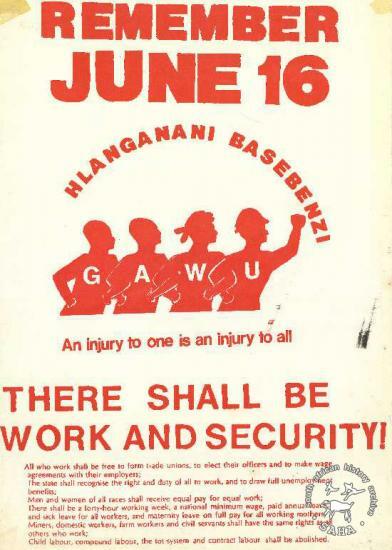 REMEMBER JUNE 16 : HLANGANANI BASEBENZI : THERE SHALL BE WORK AND SECURITY! Title: REMEMBER JUNE 16 : HLANGANANI BASEBENZI : THERE SHALL BE WORK AND SECURITY!